When you are infected with a microbe, pieces of the pathogen are picked up by sentinel dendritic cells and brought to local lymph nodes. 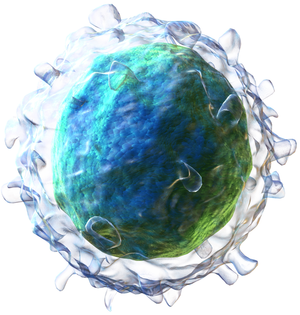 There the sentinels present their gifts to lymphocytes – B (pictured; image credit) and T cells – who then decide if they are foreign, in which case an immune response begins. These lymphocytes circulate throughout the body not continuously, but in a circadian manner – a 24 hour cycle. In mice, lymphocyte numbers peak in lymph nodes about one hour after lights are turned off. During the day, these cells leave the lymph nodes. However, the same pattern was observed when mice were kept entirely in the dark, showing that the change in lymphocyte numbers is due to an endogenous circadian clock, not a response to a change in lighting. The homing of lymphocytes into lymph nodes depends on a number of different proteins, including adhesion molecules and attractants. The levels of these proteins also peaked at night. When the receptor for one attractant, CCR7, was genetically ablated, no oscillations of lymphocyte numbers in lymph nodes was observed. Dendritic cells, the major antigen presenting cells, are also more numerous in lymph nodes during night hours. This observation makes sense given that dendritic cells present antigen to lymphocytes in the lymph node. Circadian rhythms are under the control of clock genes – the discovery of which was recently recognized by the Nobel Prize in Physiology or Medicine. Deletion of the gene encoding one such clock gene in B or T cells of mice caused loss of the rhythmicity of lymphocytes in lymph nodes. In these mice, the levels of CCR7 mRNAs also lost their rhythmic character. These observations show that circadian clocks regulate lymphocyte migration. Earth has a 24 hour day and life has adapted this cycle by turning genes on and off only when needed. It seems reasonable that lymphocyte trafficking into lymph nodes would peak during the hours when animals are moving about and potentially encountering pathogens. But not all animals are diurnal – active during the day. Mice are nocturnal, a behavior that probably helps to avoid predators. It makes perfect sense that lymphocyte trafficking in mice peaks at the onset of night. It seems likely that in humans, a diurnal species, lymphocyte numbers peak in lymph nodes during the day. Consistent with this idea, it has been shown that in humans, vaccination in the morning produces higher antibody titers compared with vaccination in the afternoon. The take away message is clear: do not get your vaccines at night! Previous post: Trial By Error: What’s Going On, BMJ Best Practice?